In this exercise, when user click on the "Recording Video using Intent" button, it will start activity with android.provider.MediaStore.ACTION_VIDEO_CAPTURE to ask Android system to start a app helping record video. When user click on the "Playback" button, the video will be played on the VideoView if exist. To ask video recording using android.provider.MediaStore.ACTION_VIDEO_CAPTURE, simple call startActivityForResult() method with Intent of android.provider.MediaStore.ACTION_VIDEO_CAPTURE. In onActivityResult() call-back function, check resultCode and requestCode. If both valid and match, the uri of the recorded video file can be retrieved using data.getData(). I think you can implement your own activity to capture video. 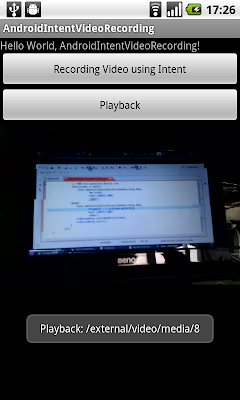 Pls refer A simple exercise of Video Capture using MediaRecorder. Please read Using MediaStore.EXTRA_OUTPUT specify target file for MediaStore.ACTION_VIDEO_CAPTURE. Great app, but can you tell me how can i capture the screen and then save and display that as a video file. Can you please tell me how do i do a screen capture and then display them as a video file. I have no idea right now! the intent is not recording video automatically. for recording video automatically what to do?